The Stanley Public Library recently celebrated National Library Week with a variety of activities, including a drawing for prizes for students who visited the library during the week. Grand prize winners, sponsored by Pinnacle and Dakota Drug, are: Katy Roise, Griffin Wilson, Adela Heberlie, Hunter Johnson, Logan Neset, Jessa Longmuir, Kerrigan Gustafson, Ashley Walter, Jevon Lebar, Ben Hynek, Karley McCormick, Zaelynn Aune, Aiden Meduna, Tyson Durfee, Kolton Longmuir, Deanda Lamping and Sherlyn Hernandez. Other prize winners are: River Nardacci, Cameron Addicott, Jazlyn Ulledahl, Ava Oosin, Sidney Enerson, Savaejah Aune, Aurora Meiers, Annie Roise, Logan Longmuir, Anna Ross, Tony Wing, Carmen Wing, Paitin Sauber, Brenna Wenger, Achaia Braddock, McKenna Jones, Laylah Wilson, Ava Shold, Trinity Mason, Erika Littlefield, Jackelyne Hernandez, Oscar Garcia, Ruth McLaughlin, Rebecca Littlefield, Maddelyn Hudelson, Levi Uran, Bo Johnson, Carter Goettle, Skylee Christopher, Kelsee Ottesen, Colton Irving-Steward, Tylie Johnson, Alice Wienbar, Kaitlyn Tronset, Lexi Neset, Shellbly Mustain, Jessy Roise, Aiden Fairchild-Brown, Rylan Craft, C.J. Francis, Zander Brannan, Jacob Altamirano, Kayden Uran, Jacob Sacro, Trenton Bruhn, Devon Wittmayer, Evan Craft, Kane Reep, Tori Martin, Errhol Tabucol, Breanna Istilart, Landon Hunting, Josh Hetzel, William Matiski, Ariadnna Hernandez, Alex Salgado, Zoey Marmon, Eli Brewer, Cooper Skarsgard, Anthony Nardacci, Cohen Bell, Brayden Fritel, Austin Kanenwisher, Rylee Littlecreek, Dilan Hernandez, Seth LeBaron, Payden Hunting, Canyon Nardacci, Isaak Longmuir, Maya Sacro, Karlie LeBaron, Blakely Bell and Henzlie Longmuir. 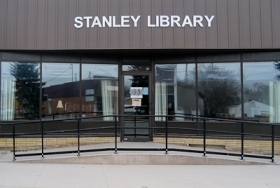 Congratulations to all entrants for visiting the Stanley Public Library during National Library Week. Prizes can be picked up this week at the library.